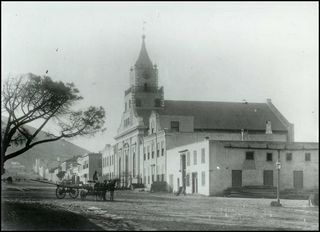 The Lutheran Church, Martin Melck House and Sexton’s House This unique group of eighteenth century buildings stands in Strand Street, higher up and across the street from Koopmans de Wet House. These buildings were designed as an architectural entity to meet the needs of the Lutheran Church. Martin Melck came to the Cape in 1745 as a soldier in the Company’s service. Four years later he became a free burgher and married Margaretha Hop. By this marriage, he became the owner the show farm Elsenburg and soon became one of the richest and most influential wine- and stock-farmers in the colony. He bought a plot in the fashionable Sea Street (Strand Street). On On 6th April 1774 he erect a building which he described to the government as a warehouse. It measured 28,6 m long by 19,5 m, wide, and was built like a church with a domed ceiling, rows of thick, rectangular columns and large English sash windows. 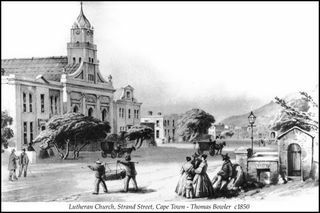 In 1779 the Lords Seventeen decided to give the Lutherans their own church and in the following year Andreas Kolver of Rotterdam began his ministry at the Cape as the first Pastor. During the next four years considerable improvements were made to the hall, but it was mainly during the year 1787 to 1792 that the building was transformed and beautified. The leading Cape sculptor of the time, Anton Anreith designed the front elevation. His main contribution was the decoration of the interior with his excellent woodcarvings. The most important of these works were the magnificent pulpit supported by two great male figures and the choir-stalls, with a carving of King David in high relief. The consistory was added during this time. In 1818 the church had to be rebuilt quite considerably, because of the poor condition of the walls and the roof. A spire was also built. 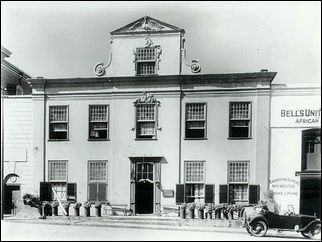 The new building was inaugurated on 20th December 1820. There have been few alterations to the church since that time. Anreith’s incomparable pulpit, the historic old pews, the lovely copper basins and font enhance the sense of devotion. Here the Church Archives and the valuable communion plate are also preserved. He later transferred it to the church and after his death a parsonage was built on it. Building commenced in 1781. The architect was Louis Thibault. The sculptor Anton Anreith, was responsible for the moulded architraves of the middle windows, the swan on the front of the building and the carving of the front door.